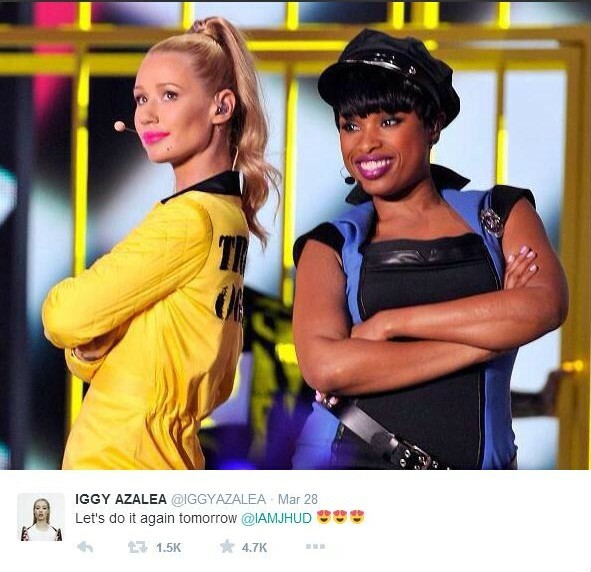 Iggy Azalea and Jennifer Hudson brought “Trouble” to Nickelodeon’s Kids’ Choice Awards 2015 on Saturday. Dressed in a yellow jumpsuit that read “Trouble 060790″ (her birthdate), the Aussie rapper emerged in handcuffs before Officer Hudson threw her in a yellow jail cell. Once behind bars, Iggy danced with her fellow inmates and held a poodle on a leash. JHUD taught her fellow officers a lesson on trouble before leading the blonde troublemaker offstage in cuffs. While Iggy didn’t get slimed (her pal Nick Jonas did), she did get to meet Chris Rock. “I’ve been a fan for so long, so that was pretty cool,” she told reporters on the red carpet. Iggy and Jennifer will performed the song again during the iHeartRadio Music Awards.